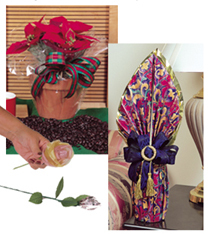 Gift basket industry professionals and creative individuals who enjoy making gifts for friends and family will devour the informative gift basket books, gift basket design videos and other resources. Gift basket books and general business and marketing books offer specific, useful tools for building a successful business. Business plan development, marketing techniques, sales letters and advertising advice are just some of the topics in the training materials developed by experienced business veterans. Gift basket industry veterans appreciate the top-notch gift basket videos and DVD ’s hosted by Debra Paulk, founder of Gift Basket Review magazine and leading-edge originator of the gift basket industry’s commonly accepted national standards for gift basket methods and techniques.